For many this would seem to be a reasonable statement because this reflects the present-day acceptance, by most Sacred Name groups, of a modified version of the Hasidic/Pharisaic practice of Passover and Unleavened Bread which encompasses the dates of Abib 14-21 with the result of an observance consisting of 8 days. 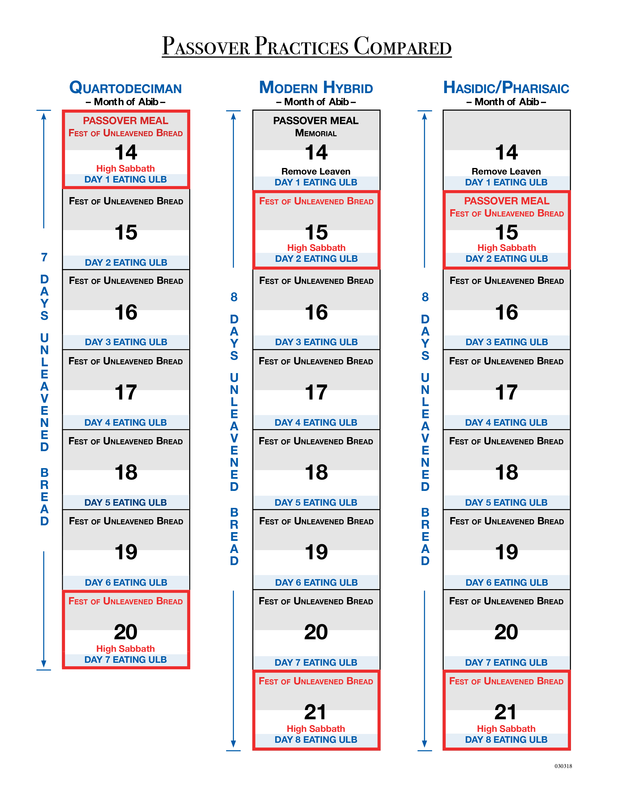 The essential difference between the older Hasidic/Pharisaic practice and the Modern-Hybrid practice, which is observed by most Sacred Name groups of today, is that the Modern-Hybrid version moves the Passover meal from the beginning of Abib 15 (System B) to the beginning of Abib 14 (System G). Needless to say, with this new arrangement of System G, there are some problems created. For instance, according to the older Hasidic/Pharisaic method (System B) all remaining leaven was to be removed from one’s residence during the afternoon of Abib 14. At the beginning of Abib 15 at sunset the Passover meal was to be eaten with unleavened bread. 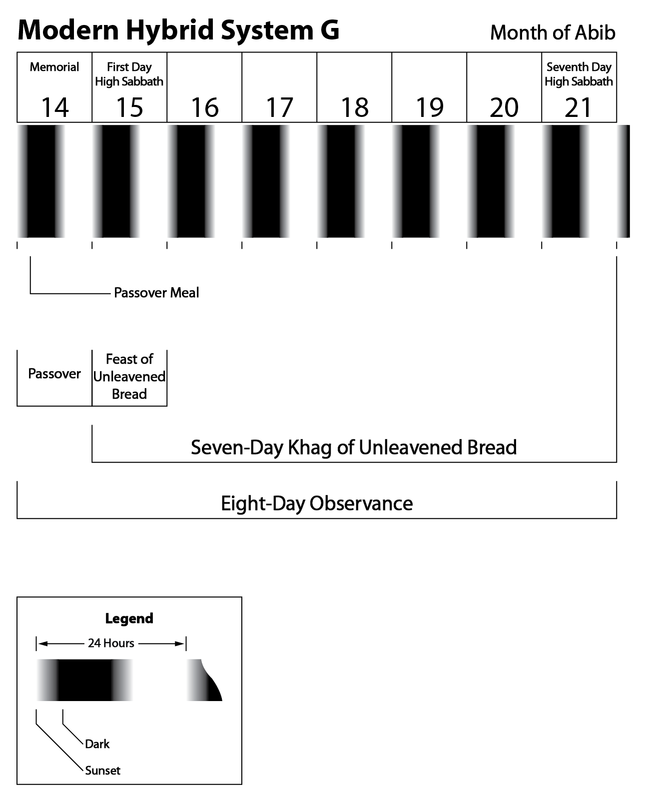 The critical issue with System B is that there is a complete removal of unleavened bread during the afternoon of Abib 14 so that with the following 7-day observance of Abib 15-21 one would necessarily eat unleavened bread with every meal. 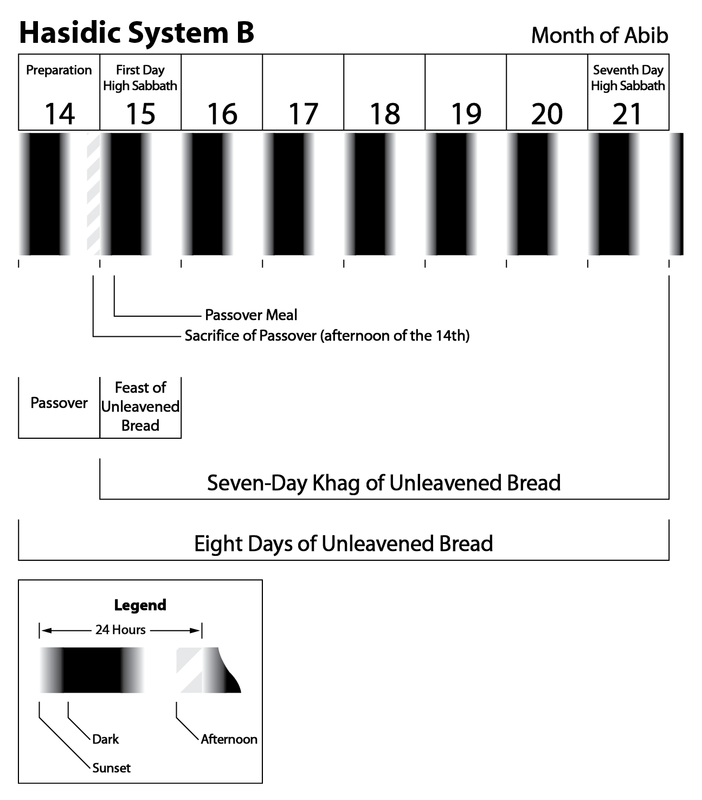 Importantly, under System B, unleavened bread is required be eaten during these 7 days. This arrangement for Hasidic/Pharisaic System B also produces a total of an 8-day observance for Passover and Unleavened Bread consisting of Abib 14-21. With the Modern-Hybrid System G, which is practiced by most present-day Sacred Name groups, one would eat the Passover meal with unleavened bread at the beginning of Abib 14 at sunset. Leavening is allowed to be in one’s residence during Abib 14 and it can actually be eaten after the conclusion of the Passover meal itself but it must be completely removed by the start of Abib 15 at sunset. Both Versions practice an 8-day observance. The obvious problem that arises with the Modern-Hybrid System G is the fact that it requires the eating of unleavened bread for 8 days and not 7 days as with the older Jewish System B. Also, what is disconcerting, is the glaring omission in Fact #5 which should include the command in Exodus 12:8 that one is actually required to eat unleavened bread with the Passover meal! This prompts the question, If one is required to eat unleavened bread at the beginning of Abib 14, is there any possibility that this very day could be the 1st official day of the 7 days of eating unleavened bread? Additionally, due to the fact of being required to eat unleavened bread at the beginning of Abib 14, could this very day of Abib 14 also be the 1st day of the Festival of Unleavened Bread? Regarding the Modern-Hybrid System G, we must now turn to a few other Scriptures for more guidance on the matter. These passages from Deuteronomy quite explicitly confirm that the 7 days of eating unleavened bread consist of Abib 14-20. Importantly, notice that unleavened bread is to be eaten for 7 days and 7 days only! The Modern-Hybrid System G requires one to eat unleavened bread for 8 days! Due to moving the Passover meal from the beginning of Abib 15 to the beginning of Abib 14, the proponents of the Modern-Hybrid “System G” are forced to manipulate the plain instructions from Scriptures which state that one is to eat unleavened bread for only 7 days. Let us now compare the Modern Hybrid Practice with the Hasidic/Pharisaic Practice. We have also provided the ancient Quartodeciman Practice for added perspective. • The Quartodeciman Practice does not allow the eating of leavened bread at the beginning of Abib 14. It is required to eat unleavened bread at the beginning of Abib 14 at sunset. -Only unleavened bread allowed to be eaten at the beginning of Abib 14. -One eats unleavened bread for 7 days, Abib 14-20. • The Modern-Hybrid Practice does not allow the eating of leavened bread at the beginning of Abib 14. It is required to eat unleavened bread at the beginning of Abib 14 at sunset. -One eats unleavened bread for 8 days, Abib 14-21. • The Hasidic/Pharisaic Practice allows for the eating of leavened bread during the early part of Abib 14 but then requires the removal of all leavening during the afternoon of the same day. If bread is to be eaten during the afternoon it would by necessity be unleavened. -Only unleavened bread allowed to be eaten during afternoon of Abib 14. It is clear that the Modern-Hybrid “System G” cannot stand the scrutiny of Scriptures. When the plain facts are recognized and understood then Yahweh’s truth is revealed. One can easily determine that if one moves the Passover meal from the beginning of Abib 15 (System B) to the beginning of Abib 14 (System G) then the scriptural command to eat unleavened bread for 7 days can only be kept by observing the dates of Abib 14-20 for Passover and Unleavened Bread . The bottom line is that one cannot take the flawed practice of an 8-day observance of Passover and Unleavened Bread, as with the Hasidic/Pharisaic System B, and then slightly modify one aspect of it in an attempt to bring it into more conformity with Scriptures resulting in the Modern-Hybrid System G. Unfortunately, there are still 8 days being observed for Passover and Unleavened Bread by both practices. For the Modern-Hybrid System G, what is even more damaging is the fact that it demands not only an 8-day observance but it also demands 8 days of eating unleavened bread which is nowhere commanded in Scriptures! The reality is that in order to attain a true and correct observance for Passover and Unleavened Bread one should have scrapped the whole premise of the Hasidic/Pharisaic System B altogether before attempting any true conclusion of the matter. According to Scriptures any purported truth that contains any leaven is not really truth at all. When one correctly utilizes the mathematics of Scriptures, one can readily uncover Yahweh’s truth regarding the timing of Abib 14-20 for the Festival of Passover and Unleavened Bread (System A). Hopefully, there will be a reawakening in the near future for the many followers of Yahweh as it pertains to the correct and true observance of his Festivals and Sacred Days. This entry was posted on 02/05/2018, 4:55 pm and is filed under Abib, C.O. Dodd, Calendar, Easter, Exodus, Feast Days, Holy Days, Passover, Quartodecimans, Scriptural Calendar, Unleavened Bread. You can follow any responses to this entry through RSS 2.0. You can leave a response, or trackback from your own site.